5 Stars! I LOVED this book! First, I love the cover of this book! Alison Temple, aka Alison Wonderland, as she is looking out at London across the river Thames, with the London Bridge in the background, from her perspective! To find out how the last name of Wonderland figures in, you have to read this book! It is hilarious! If only I could think of neat plays on words like this, as this author, Helen Smith, does throughout her book! Helen Smith's prose is pure British colloquialism, which for the American reader, does take a bit to adjust to, as we are not quite used to it. After adjusting to it, and it has to be appreciated, oh, there is so much humor! In fact, this is part of what makes this book so appealing, entertaining, descriptive, thought provoking, and hilarious at times! I love the British slang and trying to figure out what some of it meant. I needed a little help along the way, and did find it. Some British slang is so different than what we are used to, it gives this book an edge above the rest. You won't easily find sassy writing like this very often, and when you do, it is truly a flavorful treat to enjoy! The author also brings to light several current events and talks about them from Alison's perspective throughout the book, for instance one of them being about genetically modified foods, which is a HUGE concern of mine as well, and continues on still today. I'm glad she brings several of these issues up. These issues 'do' need to be made more aware of and she does this in a great way through the characters. This story starts of with Alison hiring a PI to find out whether or not her husband is cheating on her. The answer is yes. She spray paints a nasty message on her wedding dress just for her husband and leaves him. My kind of girl! Alison ends up getting a job with the same PI firm she used in her hometown of London to spy on her husband with, Fitzgerald's Bureau of Investigation (the FBI). She is given several different assignments to work on at a time, which includes all types of various things to do, including stakeouts and more! Actually, she is given quite a variety of different assignments. Alison has a great way of being very descriptive of people so well, at this point, especially a particular co-worker, that they are things we think about people, maybe feel a little guilty thinking this way, wondering if other people think the same way, and they do! I really enjoyed this! Alison tells us a lot about the different characters in this book. It's so descriptive it's quite enjoyable! Aside from Alison's job at the PI Firm, Alison's new best friend, Taron, wants her to find out where people leave, or drop off babies when they are not wanted. Taron decides she wants to get one of those babies and raise one. Alison's not so sure Taron is quite up to this task. On a whim, Taron decides she and Alison should go on Holiday (vacation) to the coast in Weymouth, England, and they go on the spur of the moment! What fun and a joy to read! You never really know what's coming next in this story at times, which makes it so fun to read! I HIGHLY recommend this book if you like true British writing! You will definitely find that here and can really learn to appreciate it! This is a great, FUN, short book to escape with! Enjoy! As a matter of fact, I was lucky enough to talk to the author, and she gave me some links to some of the areas in London where this book took place! I won't list them here as I don't want to add 'spoilers' to this review, but IF you have read this book, and are interested in knowing where some of these events took place, leave a comment with your email addy and I'll get back to you! Helen Smith is a member of the Writers Guild of Great Britain and English PEN. She traveled the world when her daughter was small, doing all sorts of strange jobs to support them both - from cleaning motels to working as a magician's assistant - before returning to live in London where she wrote her first novel, which was published by Gollancz (an imprint of the Hachette Group). She writes novels, children's books, poetry, plays and screenplays, and was the recipient of an Arts Council of England Award. She's a long-term supporter of Freedom From Torture and mentors members of an exiled writers group to help them tell their stories. She is currently under commission to write a play and has a pilot for a TV series in development. She's also working on a new novel. She likes knitting but she doesn't like driving. She likes dancing. She has a blog at http://www.emperorsclothes.co.uk. Come and say hello! Below is the NEW COVER as of January 2012 for this book, in the Amazon LINK to purchase the book below. I'm kind of disappointed because I felt the cover that is at the TOP of this review fits the book the BEST! 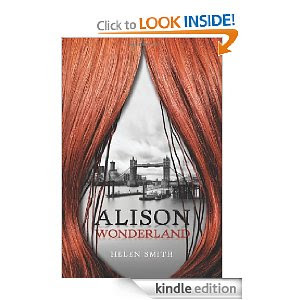 As I said in my review, it is Alison's view of London through her eyes. I LOVE that cover! Well, this is THE "NEW" COVER! It's beautiful as well, but I still feel the original cover fits the book best! If you would like to purchase this book to read and enjoy it yourself, available in paperback or in Kindle format, just click on the ICON below! It will take you directly to the page where you can purchase it! ALL sales go toward supporting this Blog! I thank you ahead of time! Best of all, enjoy this book! It's well-worth the wild, fun escape from what can be doldrum days at times! This book will definitely keep you entertained, the British way!